ooLaLark draw me a sheep? All info has been taken from member posts. Keep in mind they're all personal opinions, & people have different fit preferences. There are links to the seller sites (when available) as well as to reference pics (when available). Note: Feel free to help! If you have any info or pictures to contribute, post a reply & I'll do my best to update this list in a timely manner. *Luts shoes for MNF's should fit, but are sold out on their site. Can possibly find them second hand. Kid Delf shoes are too big, Cutie Delf shoes are too small. ?? Some say they fit MNF, others say too big. Update if you can. I couldn't find pics on MNF feet. ?? Some say they fit MNF, others say too big. Update if you can. *The LW site says their shoes measure 5.4cm, indicating they might be too short for MNF's 5.5cm feet. This Ebay store has been recommanded to me a few times that is great for girl shoes. Here is a picture of a Minifee wearing them (photo courtesy meike) , sorry, not a fit picture but rather show a general scale thing. There were several more in the Minifee thread but I have no idea how long ago was that now. How about Volks MDS size? EDIT: I just measured my 47cm Obitsu girl and her feet are 5.5 cm x 2.5, as long as but narrower than Kid Delf. I checked on Parabox/Obitsu's site and they have new shoes up, several listed as MSD/Unoa that might fit. I'll order a pair, but I won't have my Shushu for two months. Can anyone check this? What a great thread! Thanks for your hard work! I can verify that Dollmore shoes are WAY too big for MNF . . . don't have any pics ATM but I suppose I could take some. I've found the Dollzone shoes to fit the length of a MNF foot perfect (though depending on thickness of sock, it may not fit), but they are a little bit wide (not insanely), and you'll want to avoid ones with ankle straps, as MNFs have tiny ankles compared to DZ. I can post a pic in a few days (when I stop being lazy). Im confused...The foot size for mnf's are 5.5cm's right and LK's shoes size are 5.4cm', wouldnt they be tight on the mnf feet? Might fit, since the site says their shoes are compatible w/MSD & Unoa. This post says they're a pretty good fit, may need tights or socks. The 1/4 shoes from Ruby Red are pretty good, but some need tights or socks to really fit. They're all a bit long, but the "Got Spots" leopard print are a great fit width-wise. Boneka's MSD size fit perfectly. They have their own site, but Denver Doll carries them and it's much easier to navigate. I've put Bobobie boots and kitty shoes on my MNF A-line boy and they fit. Dale Rae flats fit do also fit MNF boys, not just girls. I was wondering has anyone ever bought shoes from Soom's Rosette School? There are two boots on their sight I was just drooling over and I wanted to know if my bank account should be worried. I don't see any explanation of sizes, and the doll feet apparently are 5.3 cm, so would that mean the shoes might be too tight? 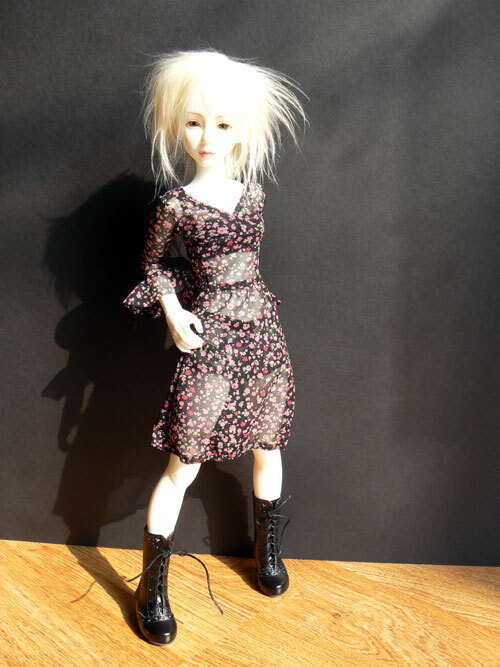 I have most of the Iplehouse JID girl flat shoes and they do fit the MNF quite well; however, as was previously stated elsewhere, the tall boots are some too tall for the shorter MNF girl legs. The IH JID ankle boots are good on MNF, in fact, they are my favorite for fit, scale, and style. Some of the styles being sold to fit the Tonner Lark, Wren, etc. being sold by Debs-Adorables on ebay will work for MNF Active line feet. 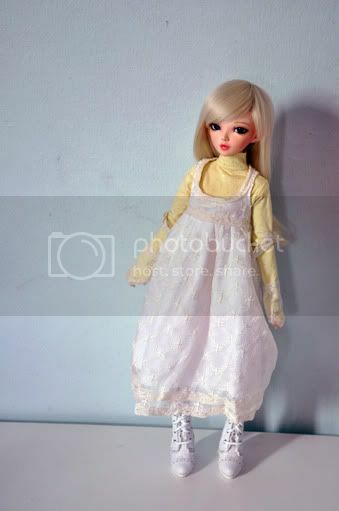 Since I am extremely picky and cannot abide overly large and out of scale looking footwear for my dolls, I feel comfortable in just vouching for the ballet flat style with bow, the T-strap with toe perforations, and the basic Mary Jane style. I cannot recommend the boot style as the tilt of the boot shaft is wrong for the shape of MNF legs and they cannot stand by themselves in them. I just want to reconfirm that I got a pair of Bambicrony boots and they fit my Minifee very well. Just that I am having a bit of difficulty to make her stand in them properly but nevertheless, fits like a glove. I will take a picture and show when I can. I give my stamp of approval to TTYA MSD sneakers for Fairyland MNF dolls. Here is a link to my post in another shoe thread of a dressed doll wearing them. Picture of my Minifee Chloe wearing Bambicrony shoes. If not mistaken, this should be Brava Bambi size. They fit very well, as if made for the girl. Just a bit difficult to make them stand in these shoes. I think it's because of the heels. Hi. wondering about width. As long as the lenght is 5.5/6cm, it would fit just fine? doesn't matter the width? I have a pair of Kish, Lark, Piper 14" doll shoes (I got them from Debs Adorables on ebay) and they fit perfectly. They are priced well too. This picture shows one on minifee (right, with painted toenails) and one on a shinydoll fragille. Fragille's feet are about the same size as minifee but slightly slimmer - and you can sort of tell that, but it's fractional. Does anyone know if there are any shoes for MNFs in any of the shops in Taobao? The Dollzone boots the girl is wearing here do not fit. They are much to large and loose inside. They look good though, being clunky. The following shoes from Releaserain fit: The goth buckle boots (visible on my flikr, can link if needed but posted in a couple places already), and the pink buckle shoes fit, though these are fairly roomy and fit much better with socks. They can stand unassisted in them and they do not look overly large. Again, pic available on flikr, will post if needed. Love the shoes but I have to ask where did you find that CUTE bag??? My girls would love a bag like that! !